It's an engineering feat that could make the great wall look small: a high-speed train from China to the U.S. According to a report in the Beijing times, Chinese officials are considering building a high-speed rail line that would start in northern China, go up through Russia and connect through Canada into America. The proposed line would be more than 8,000 miles long. That's like travelling from New York to Los Angeles almost three times. It would have an underwater tunnel that stretches 125 miles - four times longer than the tunnel connecting England and France. Wang Mengshu, of the Chinese Academy of Engineering, in an extensive interview with the Beijing Times, laid out the general strategy of China utilizing its growing expertise in high-speed rail construction to create a World Land-Bridge. It seems that China has forcefully taken up the policy which had been announced over 100 years ago in the U.S. as "girding the globe with tramway of iron" as expressed by Gen. Joshua Owens after the successful completion of the Transcontinental Railroad. The dramatic nature of the cultural shifts in the two countries, the U.S. and China, is underlined by the increasing collapse of U.S. infrastructure and the desire of China to become the chief producer of transportation infrastructure for the world. The recent visit of Chinese Premier Li Keqiang to Africa is just the latest example of that policy. Professor Wang noted four primary directions for the Chinese high-speed rail construction: (1) a Eurasian line with two branches, one going through Kazakhstan and another entering China at the Chinese border from Russia at Manzhouli and proceeding east to Khabarovsk; (2) a Central Asian Line, starting from Urumqi and proceeding through Kazakhstan, Uzbekistan, Turkmenistan, Iran, and Turkey, and then on to Germany; (3) a Pan-Asian high-speed rail starting from Kunming and proceeding through Vietnam, Cambodia, Thailand, and Malaysia, and arriving at Singapore; and (4) A line going through northeast China and then through Siberia to Chukotka, where it will meet with the planned Bering Strait tunnel to Alaska. There are also discussions with Russia regarding the gauge for a high-speed rail traversing Russian territory. The Chinese wish to build it using the international 1435 mm gauge rather than the wider 1524 mm gauge used by the Russian railroads. With regard to the first two lines, Wang said, the domestic side is progressing well and the foreign sections are still under consideration. On the Pan-Asian line, construction has begun on a China-Myanmar railway tunnel. 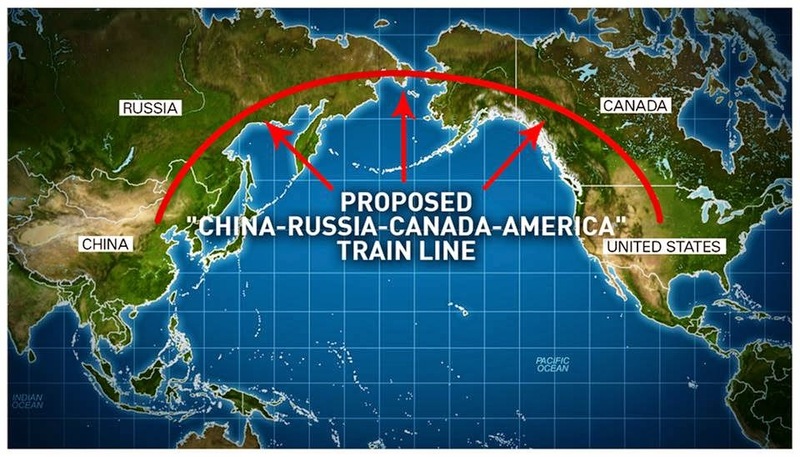 The Siberian line is still a matter of negotiations, but Wang indicated clearly that China would be prepared to help finance and build a tunnel under the Bering Strait. Professor Wang indicates the benefit accruing to China in this "going out" policy. First, they can exchange their infrastructure investment for the needed energy resources possessed by many of these countries in lieu of cash payments. In the case of Myanmar, it will be the supply of potash. Second, it provides an outlet for Chinese engineers to play the key role in the surveying, planning, design, and construction of the roads, and allows them to train the personnel in the transit regions. Already now there is a regular train from Zhengzhou which carries exploration equipment and technical personnel destined for Central Europe and other regions of the high-speed rail line. Participating in the Bering Strait project would also give Chinese engineers the experience they would need to build a similar tunnel between Fujian and Taiwan, Wang explains. Three major challenges still remain. One is the financing. Although China has proposed establishing an infrastructure investment fund for this purpose, it would also expect capital to come into the fund from other sources. Second, the logistical problems of staffing the various countries along the route with a minimum of delay with regard to customs, inspections, and the like still remains as an issue which must be overcome to extract full advantage from the increase of speed. Third, there are still the geographic and geological impediments along the complex Eurasian route which must be overcome for a high-speed rail line.